The Bel Dia Signature Collection is an elite collection of diamond and fancy yellow diamond engagement rings exclusive to the deBebians bridal collection. Bel Dia signature is a handful of select stones set within specifically designed diamond accented and halo masterpieces creating individually important pieces of jewelry. Each signature ring is a one of a kind and an example of deBebians excellence in jewelry design. Every ring is coined with a name to personify how each design is built with the elegance and grace of true royalty. All of the engagement rings in the Bel Dia Signature Collection feature master level workmanship. Extensive micro pave set diamonds, large accenting side stones, and unique basket designs all characterize the level of excellence deBebians strives to achieve. Each ring offers an example of the endless possibilities available to you when designing a diamond engagement ring here at deBebians. They are great examples of both antique and contemporary bridal designs to inspire the royalty in all of us. A few of my favorite Bel Dia signature pieces are the Astrid, Catherine, and Elizabeth. I selected these three because they exemplify what I love about fine luxury diamond engagement rings. Astrid features an Asscher cut diamond which is a newer very chic diamond cut. 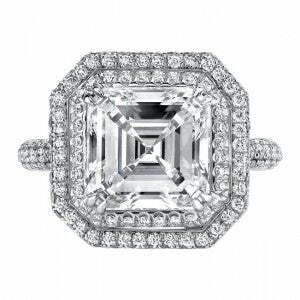 An Asscher diamond personifies the modern bride because its faceting is step cut like an emerald cut, and its shape is square like a princess. The double halo gives brilliance and sparkle modernizing the ring while the maintaining of truncated corners is more antique. The Catherine features a fancy yellow cushion cut diamond accented with brilliant cut side trapezoids and a pave diamond halo. Notice the use of 18kt yellow gold double prongs on the cushion for extra support and style. 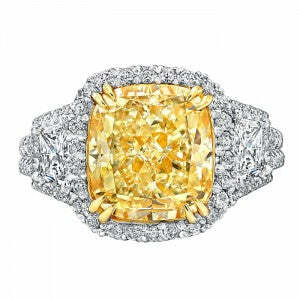 I love the contrast of yellow and white with the use of side stones in this ring. 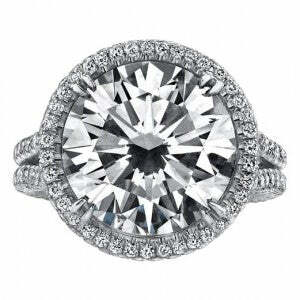 In my opinion, a round brilliant cut diamond set with a pave diamond halo will always be a staple amongst engagement ring enthusiasts. The Elizabeth ring is timeless from its inception. The pave diamonds cover the entire contour of the setting which is very unique. The tight curving split shank gives more support to the ring considering the size of the stone as well as more coverage on the finger of whoever’s hand this ring will go to. The use of round brilliant diamonds throughout this ring in addition to the approximate 7 ct. center diamond makes for the most brilliant diamond engagement ring. If you have any questions regarding pricing on any of our Bel Dia signature collection rings, feel free to contact any of our staff gemologists. It can’t hurt to ask!